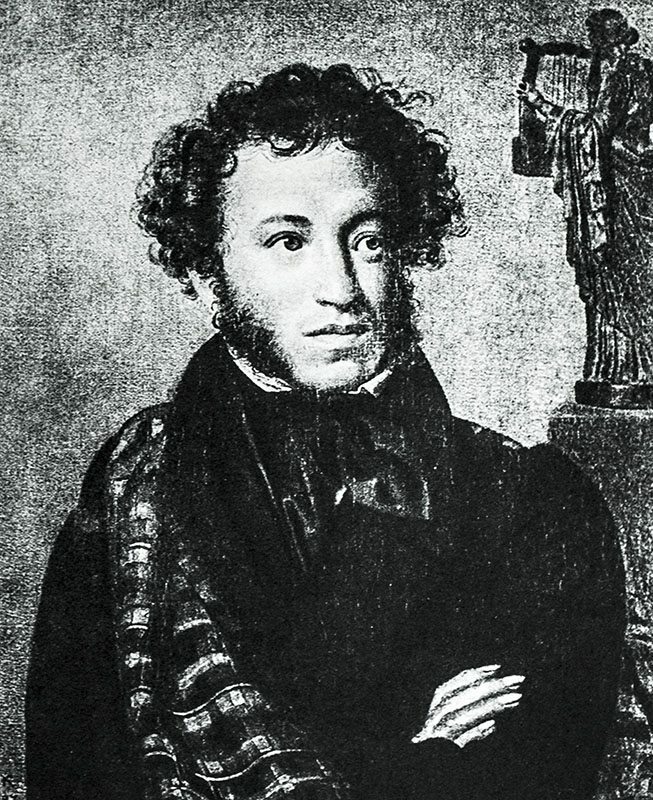 Pushkin, Aleksandr; Translated by Vladimir Nabokov. New York: Pantheon Books/Bollingen, 1964. 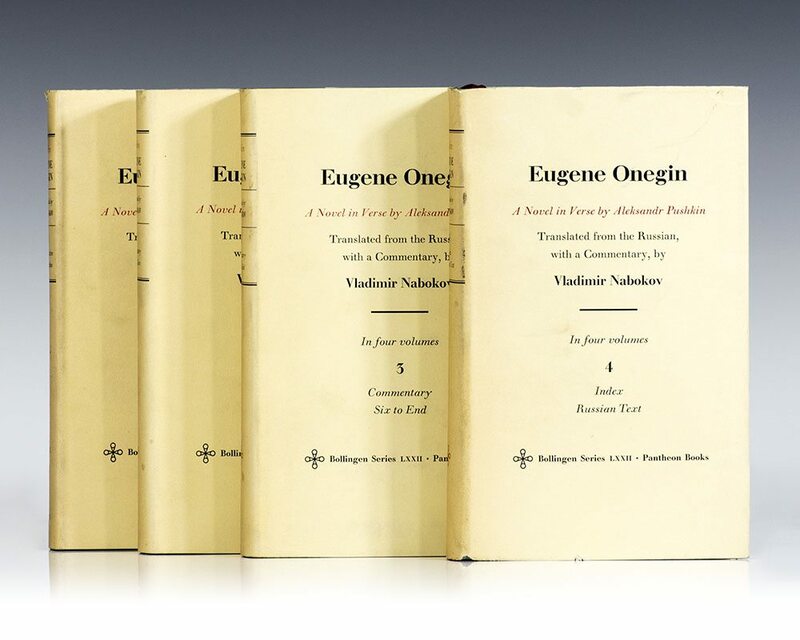 First edition of “perhaps [Nabokov’s] ultimate masterpiece” (J. Thomas Shaw). 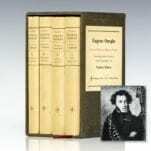 Octavo, original cloth, 4 volumes. Fine in a near fine dust price-clipped dust jackets. The slipcase is in near fine condition. Jacket design by Bert Clarke. 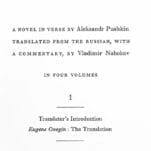 Translated from the Russian, with commentary by Vladimir Nabokov. Uncommon in this condition. 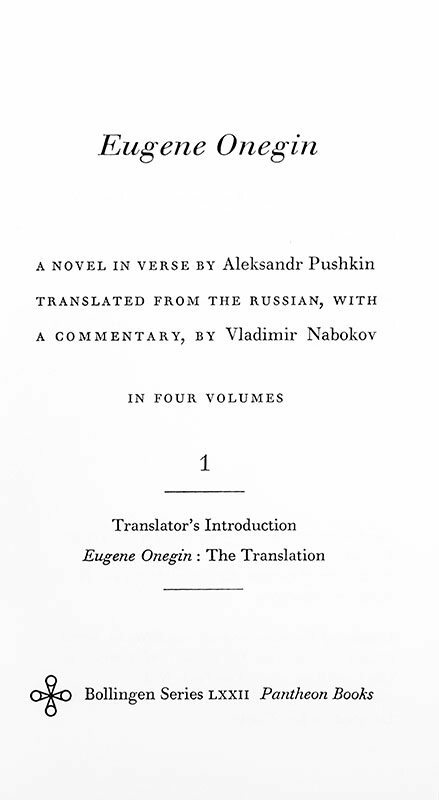 "In an era of inept and ignorant imitations, whose piped-in background music has hypnotized innocent readers into fearing literality's salutary jolt, some reviewers were upset by the humble fidelity of my version. . . ." Such was Vladimir Nabokov's response to the storm of controversy aroused by the first edition of his literal translation of Eugene Onegin. 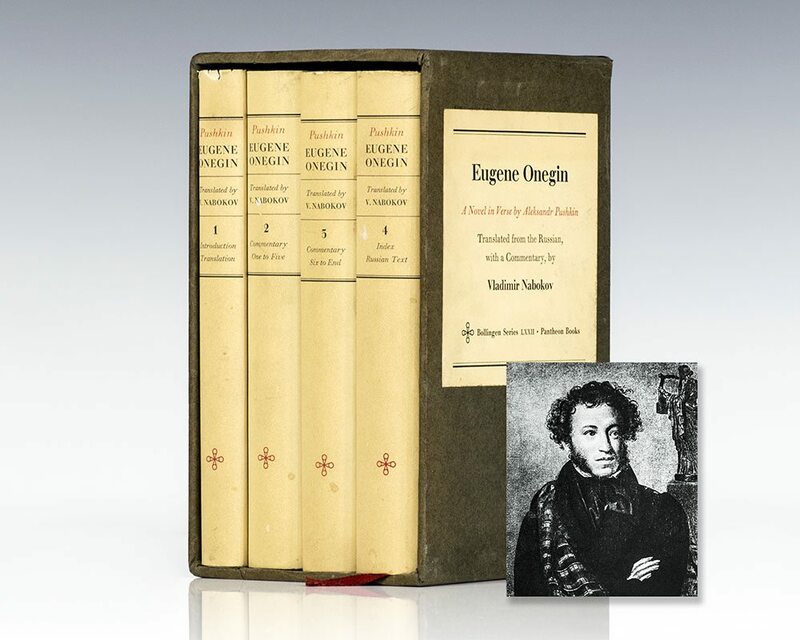 This bold rendering of the Russian masterpiece, together with Nabokov's detailed and witty commentary, is itself a work of enduring literary interest, and reflects a lifelong admiration for Pushkin on the part of one of this century's most brilliant stylists. "Mr. Nabokov has not merely rendered the most precious gem of Russia's poetic heritage into limpid, literal poetic translation. 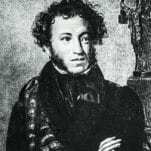 He has given Pushkin's wondrous lines the glow and sparkle of their Russian original" (Harrison E. Salisbury, The New York Times). 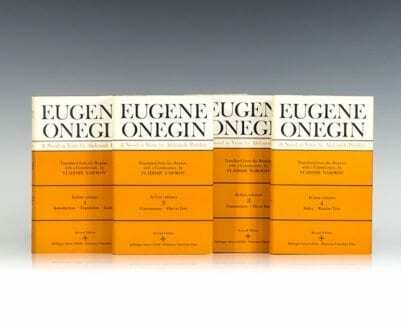 Princeton, NJ: Princeton University Press, 1975. First edition of the revised edition of “perhaps [Nabokov’s] ultimate masterpiece” (J. Thomas Shaw). 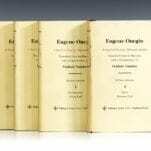 Octavo, original cloth, 4 volumes. 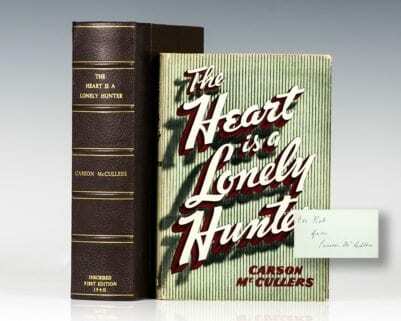 Near fine in a near fine dust jackets. Jacket design by Laury Egan. Translated from the Russian, with commentary by Vladimir Nabokov.